When it comes to protecting yourself from outdoor annoyances, what better way than protecting yourself with Mother Nature’s offerings itself? Though often unseen, many plants contain a vapor barrier provided by their essential oils that protect them from potential threats in their environment. The doTERRA TerraShield essential oil blend harnesses these plant-protecting essential oils into one product for an effective outdoor blend. 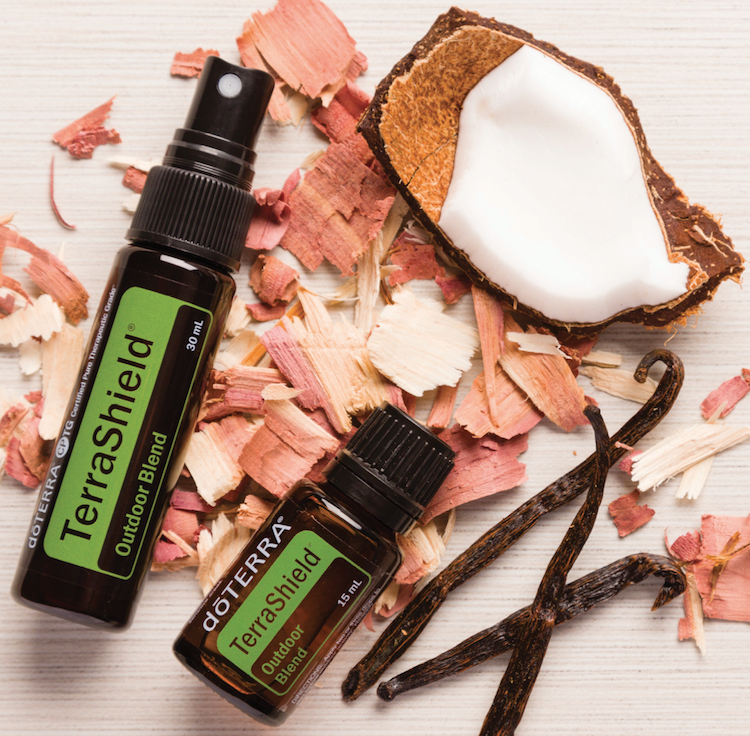 Combining Cedarwood, Ylang Ylang, Catnip, Lemon Eucalyptus, Litsea, Nootka, Arborvitae, and Vanilla Bean Absolute, TerraShield is a topical and aromatic blend that can improve any outdoor adventure as its natural ingredients aid in protecting against environmental annoyances. Whether you’re a hiker, biker, camper, or outdoor enthusiast of any kind, you will love the convenience and protection that the doTERRA TerraShield Spray provides. You can keep it in backpacks, purses, and vehicles to ensure bug bite prevention on the go. It is easy enough for the whole family to apply and is safe on your little ones! Help your kids take advantage of their summer outdoor activities by keeping them protected from insects. TerraShield is most commonly known for its ability to act as a natural and effective barrier and to protect against outdoor threats. These protecting effects are a result of Cedarwood, Arborvitae, and catnip plant essential oils which contain natural repellant properties. If you are looking for a natural barrier for yourself or your loved ones, TerraShield is the perfect essential oil blend to use. Because the TerraShield essential oil blend is made up of essential oils from plants, it is natural and safe to use on the whole family. So put away those toxic outdoor sprays, liquids, or lotions, and try something a little more organic with doTERRA TerraShield oil. To help your kid’s get the most of their summer vacation, make sure they are thoroughly protected and prepared for their outdoor adventures by applying the TerraShield essential oil blend topically. For best results, apply TerraShield to your child’s arms and legs before he or she goes outside, and make sure to get your arms and legs, too. TerraShield not only protects you when you’re outdoors, it can also be used to protect you while indoors. Spray the TerraShield essential oil blend around your door and windowsills to protect your home. You can also use TerraShield around tent doors and windows while camping. For your next fishing trip, apply TerraShield oil to your arms and neck or place a drop of TerraShield on a piece of Aromatherapy jewelry and wear it while you’re out. If you’re interested in making your own Aromatherapy jewelry, visit doTERRA’s DIY Aromatherapy Jewelry page. The outdoors provide limitless amounts of fun and amazement that should not go unnoticed. With the doTERRA TerraShield essential oil blend, you can focus on experiencing the many facets of nature while avoiding those occasional environmental annoyances. This oil will provide you with a new level of comfort in the outside scene and allow you to enjoy every minute of Mother Nature’s beauty. This entry was posted in Emergency Preparedness, Health, Outdoors, Seasonal Threats, Specific Oil Uses and tagged cedarwood, Eucalyptus, Lemon, TerraShield, ylang ylang. Bookmark the permalink.